The big day finally arrived, so with musket licenses sorted and identity barcodes in hand it was off across the English Channel (and for two of us, across the Atlantic!) 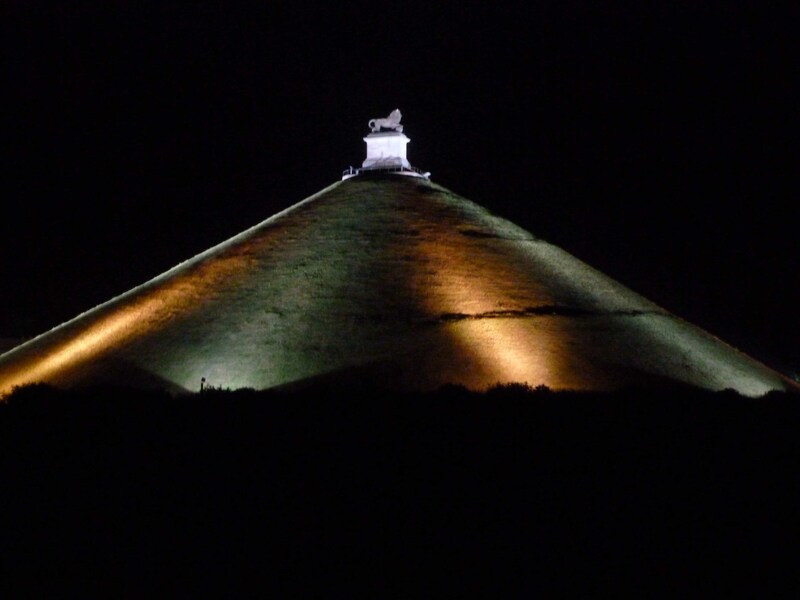 to meet Napoleon and his army (plus Belgian officiousness) at Waterloo – and to remember, in particular, those of the 32nd Regiment who fell so bravely and contributed so significantly to victory during that fateful month of June 1815. 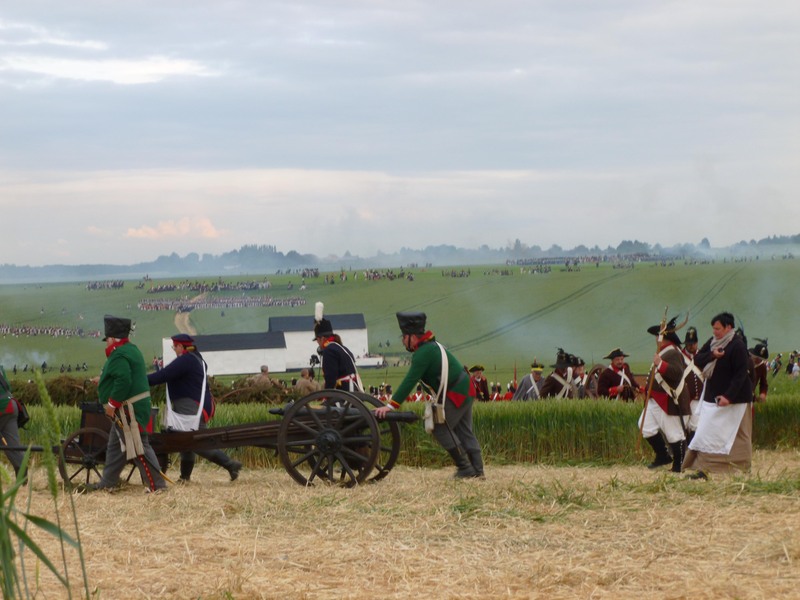 By early Wednesday afternoon (June 17th) all members of the 32nd had arrived and were busy pitching camp in our allocated section of the orchard at Chateau d’Hougoumont – yes, that very same orchard that saw some of the fiercest fighting during the 1815 battle. Within a few short hours activities were in full swing – for Wendy, Nichola and John it was off in their finery to Brussels for the Duchess of Richmond’s Ball whilst Trevor, Bob, Dave O, Mark, Randall and Keith donned full uniform and armed with Regimental Colour ‘hitched’ a lift with Jerry and headed for Quatre Bras. First stop at Quatre Bras was to lay a wreath in memory of the 32nd Regiment at the Allied War Memorial before commencing the approx 7.5 mile ‘march’ back to camp following the ‘old’ road through the village of Genappe – the route that the Regiment would have taken when withdrawing back to Waterloo from Quatre Bras on the same day 200 years previously. This context made for some very poignant emotions as we ‘marched’ back – however we were equally surprised by the interest we seemed to generate amongst many of the ‘locals’, so many of whom came out of their houses to ask questions, cheer us on and have their photographs taken with us. Interestingly our route back also took us past the French camp located close to La Belle Alliance and we were delighted when our raising the Colour, as we passed, provoked a chorus of friendly “boos”. 18 June 2015 dawned bright and dry – unlike the corresponding date in 1815 – and saw our first drill session as a section in a full ‘2 Brigade’. 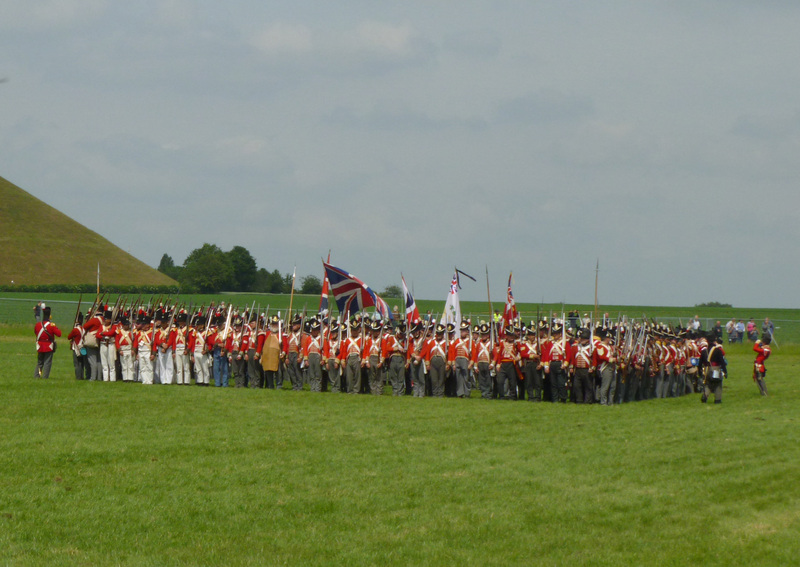 The sight of 300-400 redcoats in column and then into square was inspirational – as was the 2-minute silence held on the field at 11:30 to mark the commencement of the 1815 battle. A second ‘2 Brigade’ drill followed in the afternoon and then it was ‘fall-in’ time for those of us involved in the ‘Inferno’ production (a night-time poetic, musical and pyrotechnic interpretation of the Battle of Waterloo in twelve ‘tableaux’) and our first appointment with the paying-public at the Waterloo battlefield 2 miles away. For the 20,000 spectators it was very dramatic, for the re-enactors involved it was probably the most dangerous event of the week, but for one man – our very own Colonel – it was ‘stardom’ and a dream come true with a last minute tap on his shoulder and instant promotion to the Duke of Wellington. He held his nerve to dramatically beat Napoleon 3-2 in his first public performance as a chess player (assisted by General von Blucher), walked away with Napoleon’s queen (presumably called Josephine) as a memento and then ‘milked’ the applause of his adoring public during the ‘grand finale’ in a manner that would make any Hollywood veteran proud. 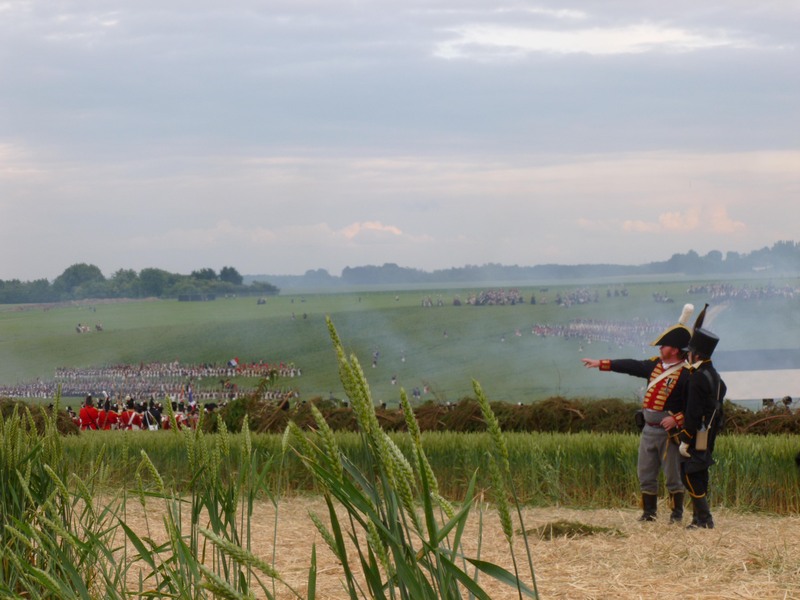 And so to the ‘sharp end’ of our week, the Waterloo battle re-enactments. Friday morning (June 19) saw some further slick drill by an ever-improving ‘2 Brigade’ and included specific comments of praise for the 32nd from various Brigade officers. 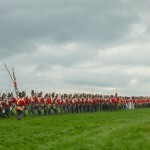 Spectacular, colourful and awe-inspiring scenes followed when in the late afternoon all 5 allied brigades, plus cavalry and artillery – a total of 3,000 re-enactors – came together to march to the battlefield. This was made increasingly evocative by the final section of the march being through the middle of the original, iconic, La Haye Sainte farmhouse and then out into 3 feet high corn sown across the battlefield to mirror the conditions in which the battle was fought in 1815. From the top of the ridge and from the stands holding 60,000+ spectators there were the dramatic scenes of columns of Redcoats and their allies snaking their way across the cornfield, to the sound of fife and drum, and taking up their positions against the ranks of the French massing to the south, on the opposing ridge. Once more the Regimental Colour of the 32nd was raised at Waterloo and, as in 1815, it was again carried by Ensign Birtwhistle (a newer, older version and not so brave!). ‘2 Brigade’ took up it’s place in the centre of the Allied army – mirroring the critical defensive role played by the ‘veteran’ Peninsula War regiments like the 32nd on that day in 1815. 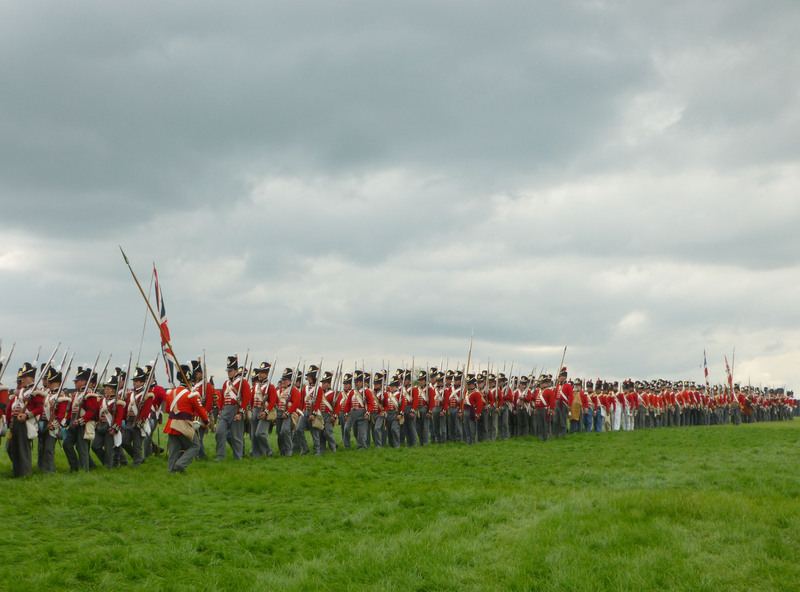 In fact our physical position in the re-enactment was only some 400 yards, or less, from where the 32nd had stood and fought ferociously as a Regiment for much of the 1815 battle – and, of course suffered such major losses. After major exchanges of roaring artillery fire from both sides, ‘2 Brigade’ began to advance across the smoke-filled battle field towards the ‘remodelled’ La Haye Sainte. However we were then forced to pull back by the onslaught of French infantry from the opposing ridge, followed by their heavy cavalry. The next hour and a half was spent ‘forming square’ to protect ourselves against the cavalry and then ‘reforming line’ in time to combat the infantry – a sequence we went through 6 or 7 times, firing musket volley after musket volley, before finally advancing again and this time, together with the rest of the allied army, claiming victory and the final defeat of Napoleon. The late, long march back to camp was accompanied not only by the celebratory music of our own musicians but also by thousands of spectators, down from their stands who stayed on to cheer the ‘conquering heros’ – encouragement that was greatly appreciated after a long hard evening! 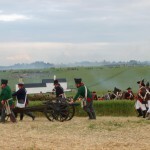 June 20th saw the second re-enactment. Once more there were the amazing scenes of the five Allied Brigades etc coming together, marching through thousands of excited spectators and ‘swarming’ onto the battlefield to face the French. The battle once more started in a similar fashion with heavy exchanges of artillery fire, numerous musket volleys and the, by now, routine sequence of forming square then reforming line in response to various cavalry and infantry attacks. 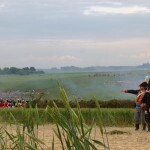 However in response, it would appear, to some negative spectator feedback from the first re-enactment, the second half of the battle was kept closer to the spectator stands and hence in a smaller area. As a result the cannons roared louder, the smoke was thicker and lingered longer, and the musket volleys flashed brighter and seemed more numerous. The end result however was the same – victory for the allies and a second night of cheering crowds helping some weary limbs get back to camp. So how does one end such a week? – a victory parade? – a party night? Sunday June 21st saw both! For the victory parade the 32nd again turned out in good numbers and with the Colour once more to the fore we were bussed, along with many others in ‘2 Brigade’, into the town centre at Waterloo where we paraded up the main street, through more cheering crowds, to a presentation ceremony involving the Dutch Royal family and numerous Senior Staff officers. A moment of light relief then followed (except for the 2 individuals involved) when one of our victorious young officers came out from the ranks and went down on bended knee and proposed to his camp follower girlfriend directly in front of several hundred re-enactors and spectators. We believe her response was, after the initial shock, affirmative! It was then time to ‘fall out’ for the final time, seek out the promised free beers and catch a bus back to camp. Although many re-enactors moved off home that afternoon, the remainder celebrated party night in style, well into the early hours – fuelled largely by the mild tasting and specially brewed Waterloo beer (a punchy 8% proof!). Happy, hazy memories! After so much fine weather a very wet Monday morning created major challenges for breaking camp and packing up wet tent canvas. However this could do little to dispel memories of five epic, awesome and emotional days. A unique experience which will live with us all for a long time – most probably the rest of our lives. Thank you to everyone for making it such a great experience but special thanks must go to Sue, Kristyn and Louise for keeping us so well victualled, Sue again for managing to find time to take some great photos and to Wendy for all her work behind the scenes organising and getting it all to happen.